Fluorescein Angiography is a valuable diagnostic procedure using a specialized camera system to photograph the retina of the eye. This diagnostic test supplies information about the delicate vascular structures of the retina that cannot be visualized in any other way. If your retina specialist suspects abnormalities of the retina, they may recommend a Fluorescein Angiogram to rule out retinal disease or to follow the course of retinal disorders. A dye called Fluorescein sodium is injected into a vein in the arm and photographed as it passes through the arteries and veins of the retina. As it first enters the retinal arteries, the photographer will take a rapid series of pictures to document any abnormalities or leakage caused by certain retinal diseases. After the test your doctor will make a careful interpretation of the angiogram, and the precise location of any abnormalities can be observed. Diabetic retinopathy and age related macular degeneration are the most common diseases requiring the use of this special diagnostic test. Many other eye disease also require regular angiograms for diagnosis and treatment decision-making. In most cases, the test is available at the time of your examination. 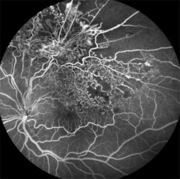 What are the risks of Fluorescein Angiography? The dye test is safe. After the dye is injected, you may notice your skin turn a yellowish tint for several hours. The kidneys filter the dye, so your urine will turn a dark yellow for up to 24 hours following the test. Rarely, patients experience slight nausea; however, this usually passes after a few seconds. Allergic reactions are very rare. Itching and skin rash can occur and are usually treated with oral or injectable antihistamines depending on the symptoms. Severe allergic reactions, including anaphylaxis, have been reported but are extremely rare.